Ever since I picked up Nathan Rabin's book My Year of Flops last year, I've been itching to do a marathon looking at some of the most notorious box-office busts in movie history. Rabin's series for the A.V. Club delves into obvious picks like Battlefield Earth and secret successes like Joe Versus the Volcano. The rest of the choices will be films spotlighted in the book, but I decided to start with the obvious pick from 2012. Adapted from the 1917 book The Princess of Mars by Edgar Rice Burroughs, John Carter tells an ambitious tale of a Confederate soldier who journeys to a far-off world. Would this viewing confirm its status as one of the huge misfires of the year? Did a hidden gem lurk beneath all the baggage of the financial disaster? It's difficult to approach this type of movie without preconceived notions, but I tried to keep an open mind while catching up with such a derided film. After attending the funeral of his uncle, John Carter (Taylor Kitsch), Edgar Rice Burroughs (Daryl Sabara) reads his journal and uncovers a remarkable tale. The former Confederate captain describes his inadvertent discovery of a cave in the Arizona Territory. He finds a medallion that transports him to the land of Barsoom, known to us as Mars. This world is embroiled in a struggle between the forces of the nasty Sab Than of Zodanga (Dominic West) and the friendly people of Helium. This war may end with the marriage of their princess Dejah Thoris (Lynn Collins) and Sab Than. 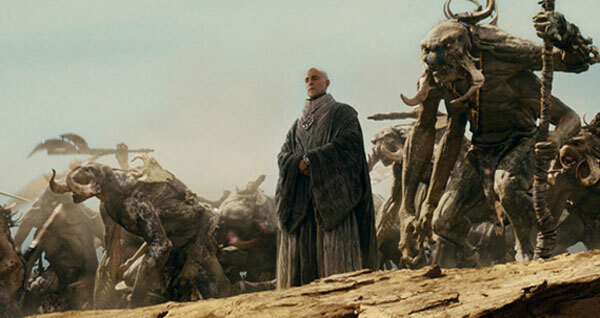 However, there's a plot behind the scenes from the Therns and their leader Matai Shang (Mark Strong). Carter can jump long distances because of his bone density, and he could be a key player. However, he's just looking for a way home. Saved by the Thark emperor Tars Tarkas (Willem Defoe), Carter must decide where he stands and if he'll to stick his neck out for his new friends. 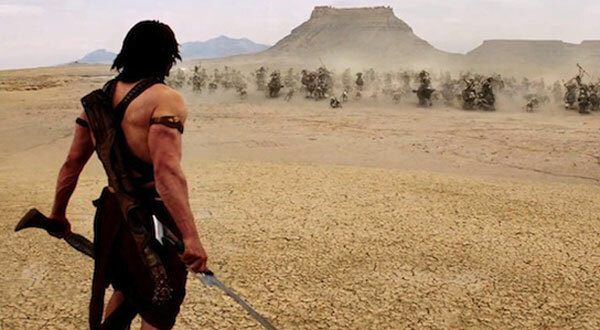 John Carter has generated a domestic gross of $73 million, so it's played to a significant audience. The catch is that its reported production budget is around $250 million. It did slightly exceed that amount in its worldwide numbers, but that's deceptive because of the marketing costs. This is such an interesting case because of the extremely negative attention prior to the release. It felt like everyone was just itching to take down this expensive blockbuster. One of the reasons is Disney, which always brings out some haters. The bland title also did the film no favors. The phrase "of Mars" was removed from the end because previous movies involving Mars have flopped. That concern is understandable, but the alternative is even worse. Another issue was the promotional strategy, which focused almost solely on the otherworldly creatures and felt a lot like Avatar. Disney needed to a do a better job explaining what the story was and pushing it as a classic adventure. It's easy to play armchair quarterback and dig into the ways John Carter fell flat. When you look at the movie itself, it's actually not that bad. The main issue is that the story's overly complicated. There's a confusing prologue that introduces the warring factions on Barsoom but doesn't make a lot of sense. By the time we get back to them, it's hard to remember exactly what we learned at the start. There is also some CGI that doesn't look believable. Even with the massive budget, Director Andrew Stanton's ambitions were so great that certain shots don't look realistic. When Carter is leaping hundreds of feet in the air from ship to ship, it's nearly impossible for it not to look like a video game. If viewers enter this film ready to hate it, this isn't the type of movie that immediately grabs you. It takes a while to get engaged in the story, and its strongest part is the final act. The plot also feels pretty familiar because many writers and directors used elements of Burroughs' work. You only need to look at a movie at Star Wars to see the similarities. When you consider all the negative press, I'm surprised that it's actually a decent film. Once we get into the meat of the story, it's an engaging adventure with exciting scenes. Taylor Kitsch isn't an overly charismatic lead, but he does fine in a straightforward part. John Carter is a very reluctant hero, and his inability to take a stand becomes almost comical at times. Even so, watching him take charge works for me and sells the oddball material. The striking Lynn Collins is also solid in the princess role and makes her interesting. Neither are the types of characters you'll remember forever, but they work in the confines of this story. The strongest part is the final act, which brings everything together and makes you forget about the confusing opening. By the time we've returned to Burroughs for a final surprise, it's actually too bad there's little chance for a sequel. 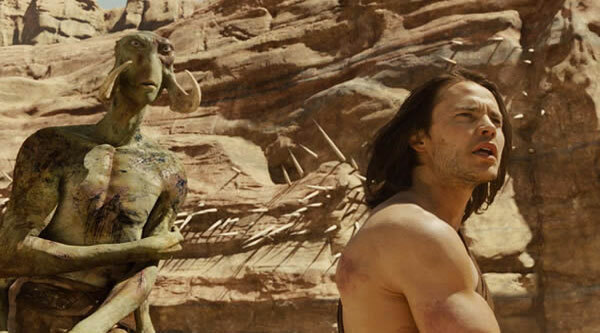 John Carter functions better as a collection of fun scenes that a complete movie. The highlight is the battle in the gladiator arena, which pits a chained Carter against two massive creatures with blood on the mind. It's a a silly fight but has just the right sense of adventure. Compared to the laughable arena battles in Attack of the Clones, this scene gets the moment right. When you're dealing with massive CGI beings, there's a fine line between keeping us engaged and creating monsters that are obviously green-screen creations. The framing story of Burroughs reading Carter's journal is an obvious trope, but it works surprisingly well. By the time we reach the end and understand the sad journey, it's surprisingly effective to see the resolution. It takes a while to get moving, but I felt the suspense when Burroughs discovers the truth. Even when you consider the messy elements, this success of the conclusion shows that the ride is worth it. 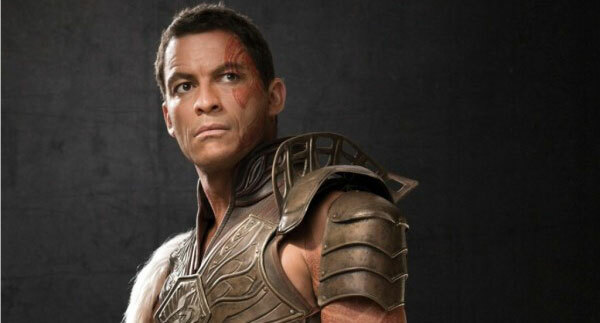 I wouldn't have expected it after the first half hour, but John Carter ranks as a secret success for me. It's an old-school adventure movie that doesn't take itself too seriously. While its quality doesn't match the original Pirates of the Caribbean film, they share a sense of excitement. Plus, you get the see the great Mark Strong playing yet another villain. Solid voice acting from Willem Defoe, Samantha Morton, and Thomas Haden Church makes the creatures feel like more than CGI inventions. It's too bad that all the negative press eclipsed any discussion of the story's actual merit. Dismissing this movie as a bloated mess is just too easy and doesn't give it the proper chance that any movie deserves. The budget shouldn't be a key factor in the success of a film. Next week, I'll check out all the fuss about the notorious flop Howard the Duck. I had real hopes for this one (I haven't seen it yet), because I grew up on the books. I read them over and over--I even own some classic printings of a few of them. Sounds like I should give in and give it a shot. Steve, I don't have any experience with the books, so I can't say how it holds up to them. It has a rough start, but I ended up having fun with the movie. If nothing else, it isn't the train wreck that I heard it was. I really enjoyed the film, and, as you hint, the real reason it was a flop was because of the foolish and expensive marketing. Steve, I definitely agree. It's remarkable that a company like Disney that has shown the ability to market effectively did such a bad job here. I think they over thought the concerns about Mars and made it look way too generic. It might not have been a huge hit, but it wouldn't have gone so far in the other direction. Couldn't agree more. It's actually a decent film that was mishandled by the marketing department. I wouldn't mind a sequel. Josh, crazier things have happened, but I'm thinking a sequel is probably unlikely. It's too bad that it was managed so badly. Also, I do think that the budget probably needed to be reined in up front. Even some big franchise movies don't make that kind of money. I found this movie to be pretty alright, even though it was a little too ambitious and a little too long and convoluted. However, it isn't as bad as people give it credit for. I do have to wonder how much this made on rentals, because it was (and still is, to some degree) quite popular when it first came out on DVD when we got it. Mind you, I'm not sure that DVD rentals generate a whole lot of money for the studios at the end of the day. Stevee, I agree that it's convoluted, especially with the opening and all the plot information being thrown at the audience. I expect that it probably did well on DVD, and your example just confirms it. I know that DVD rentals do help the studios, but with this type of gap between the budget and revenue, they probably still lost a lot of money. The question is how much beyond the $250 million they spent on marketing, which is sometimes a very high number. I do think a lot of people decided to wait for DVD after hearing the bad reaction. That was what I did. I agree, secret success. But, then again, I went in with an open mind, and not READY TO HATE, like most people I know did. That's crazy talk! You can't watch a movie with an open mind! Seriously, I'm glad to hear that you also enjoyed it. Thanks. I was entertained quite a bit by this movie. It did a good job of balancing taking elements from the books and inventing new things for the movie. 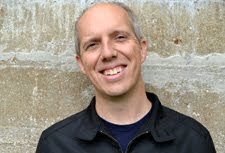 Chip, I keep waiting for someone to tell me I'm wrong, and it hasn't happened yet. Despite some awkward plotting, it's still a lot of fun and deserves another look.